Most smaller companies should not host their own videos; it’s simply not worth the investment. Those seeking third party options have two basic choices: UGC sites like YouTube and Vimeo, and online video platforms (OVPs) like Brightcove, Wistia, and newcomer Nideo, the subject of this review. UGC sites are great for many uses, but lack a host of features desirable for most companies, particularly marketing-oriented features like e-mail address collection or even the ability to distribute password-protected videos. You also can’t control which videos appear next to yours on UGC sites, a concern for some organizations. Those considering OVPs can go in one of two directions. Larger organizations that need features like monetization capabilities, digital rights management, SDKs for mobile development, integration with content management systems, and extensive security-oriented features should gravitate towards larger companies like Brightcove, Kaltura and Ooyala. Smaller companies that need marketing-oriented features and an easier to use interface should check out Wistia and Nideo. It’s important to recognize that the OVP market has been around since 2004 when Brightcove was founded, while Wistia was founded in 2006. Since the wild and wooly early days, there has been lots of company attrition, and the companies that have survived have well-developed and focused feature sets, and polished fourth- or fifth-generation interfaces. This makes the barrier to entry for new companies like Nideo quite high, though not unbreachable. Since its founding in 2013, Nideo has made impressive strides in producing a highly functional and usable platform. Key strengths include a very compact and attractive player and comprehensive analytics, though as you’ll see, player customization options and marketing-oriented features lag behind Wistia, at least as the platform currently exists. Currently, all Nideo accounts have one user account, so if you want to share upload and administrative duties, you’ll have to share the password credentials. Nideo offers a range of flexible options for uploading your files to the site, including drag-and-drop and bulk file uploading. You can upload all the usual formats, including MPEG-1, MPEG-2, MPEG-4, H.264, VC-1, and Windows Media Video in MP4, WMV, AVI, and MOV container formats. The only notable missing codec was ProRes. Nideo uses Microsoft Azure for all its encoding. Once the video is uploaded, it’s automatically processed by Nideo into a set of Smooth Streaming files for computer delivery, HLS for iOS, with a single file delivered via progressive download to Android devices. Single file delivery is the only viable approach for Android, since Android’s HLS support has multiple issues, though hopefully this will improve with Android 5.0 and later versions. For computers, Nideo creates six bitrates ranging from from 400 Kbps to 3400 Kbps, the last at 720p, with 56 Kbps stereo audio. All files are encoded with two second GOPs (groups of pictures) using the Main profile. For HLS, Nideo produces five streams peaking at 1600 Kbps. Retail Nideo customers have no control over the encoding parameters of their files, though “bespoke” clients do. This is probably acceptable (if not preferable) for most users, but if you’re looking for fine-tuning capabilities, they're not there. Along these lines, the retail platform doesn’t offer any kind of encryption or other DRM, though it’s available for bespoke clients. Closed-caption support is also not available, but both DRM and captions are on the short-term drawing board. On the playback side, if the thought of Smooth Streaming and Silverlight makes you sweat, don’t worry, you don’t need the Silverlight plug-in; instead, Nideo supports browser-based playback via Flash. Playback in iOS and Android is all native in the browser. After uploading, videos are placed in a Manage videos area (Figure 1) where you can edit the titles, customize players, and create lists of videos to be played together. These are called video lists in the Nideo system, but are more commonly referred to as playlists. Figure 1. 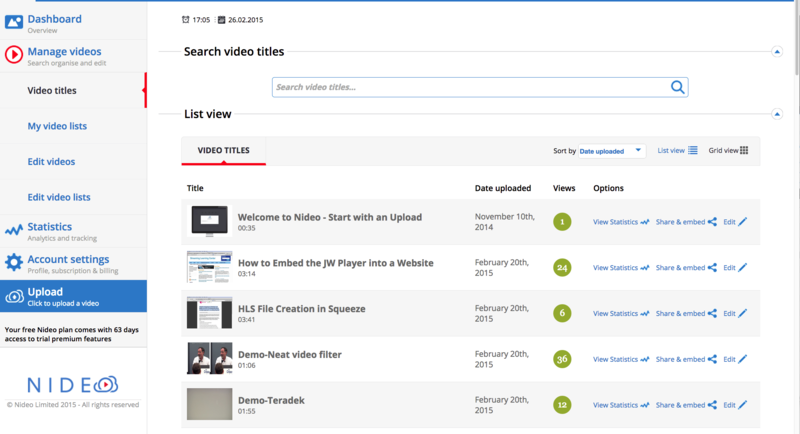 The Manage videos area where you edit your titles, create video lists and create players. WIth all videos, you can edit the title, insert tags and a description. You can also choose the thumbnail image representing the video before playback from the five created by Nideo, or upload your own. Nideo offers multiple privacy options you also select on a video-by-video basis. Public videos can obviously be viewed by anyone, while private videos can only viewed by the account owner. You can also set a password to protect your videos, or restrict viewing to those with specific email addresses. With email protection, you type in the email addresses of the target viewers and Nideo can send them an email letting them know that the video is available. To play the video, viewers have to enter in their email address, but anyone with that email address can play the video. Note that if you notify viewers via Nideo, they play the video on the Nideo site, not the embedded page. If you want viewers to watch from the embedded page, you’ll have to send them a normal email. Like YouTube, Nideo lets you embed your videos into your own website or blog, or you can play them from a page on the Nideo site. Either way, player customization is limited, at least in the short term, and there are some architectural issues that also need addressing. The appearance options are shown in Figure 2. For customization, you can choose the color, but you can’t overlay a logo or watermark, though that feature is being designed for a bespoke client and should soon be integrated into the platform. Otherwise, the main configuration options relate to the social sharing sites clickable on the player and what happens when the video finishes playing, where you can pause on the last frame, reset to the first frame, or loop playback. By comparison, Wistia offers all this, plus captions, logo overlay and the ability to add comments and the number of plays to the video. Figure 2. Player customization options are fairly limited. The architectural issue relates to how the player is customized. Currently, you have to customize each player, one at a time. 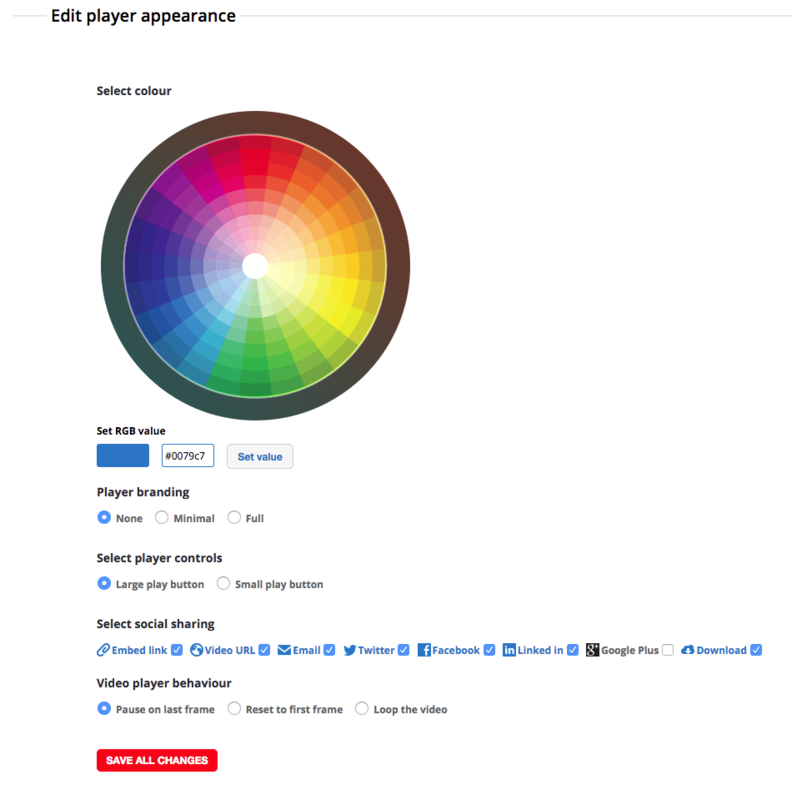 So if you upload 50 videos, and want to customize the colors and options, you have to do this 50 times, which is tedious and prone to errors. With Wistia, you can load the settings from another video, which is faster and helps maintain consistency.